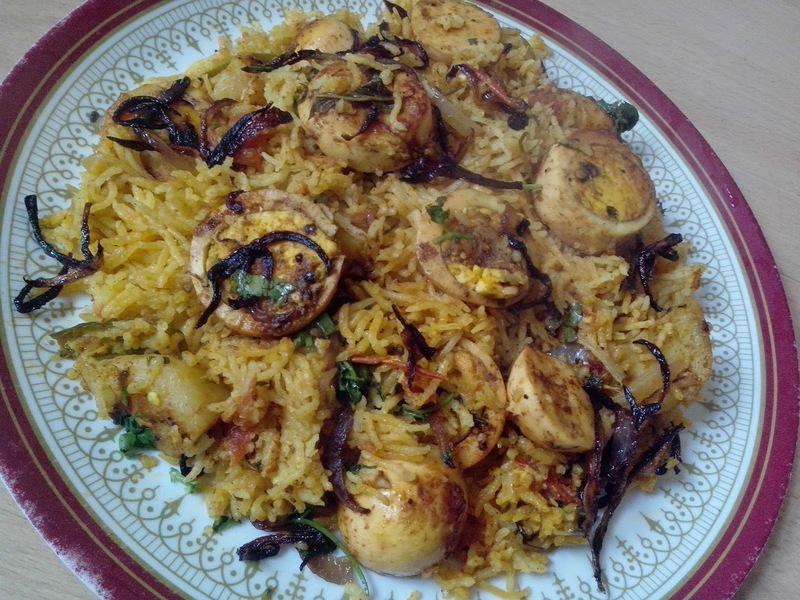 Pavi's Platter: Egg Biriyani ! 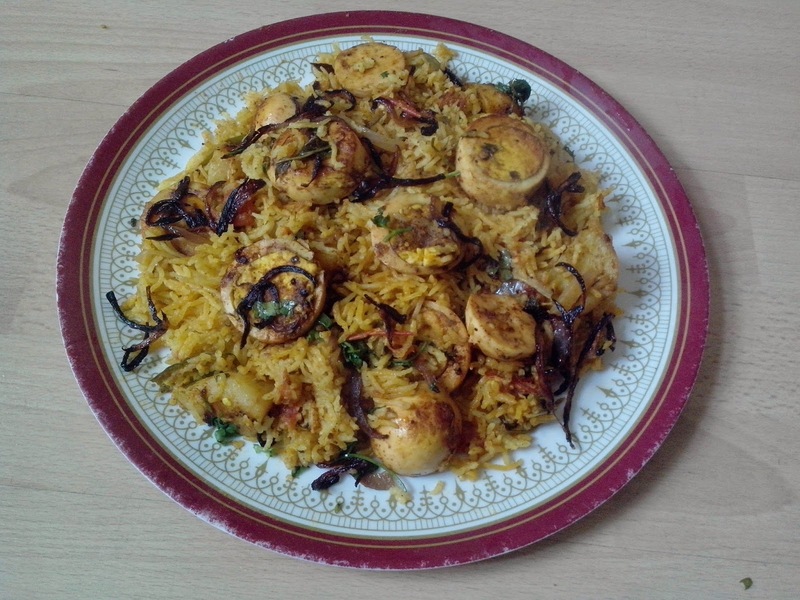 This weekend special is Egg Biriyani / Mutta Biriyani / Anda Biriyani whatever you call it.. its very simple to make when compared to the other non veg biriyanis.. I have seen ppl making this in many methods.. cooking the rice fully and adding fried eggs on top, cooking rice and eggs together.. or layering them and let it cook on dum etc. i neither wanted to add the eggs last after cooking rice nor adding it along with water to cook rice n spoil my egg yolks. So i added them when rice is half cooked. 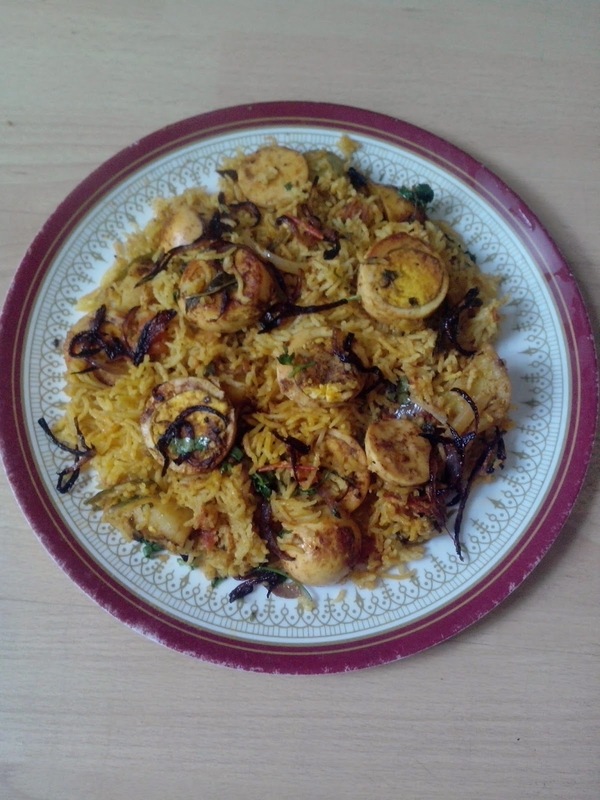 This version is adapted and tweaked from Sanjeev Kapoor's recipe. Hard boil the eggs and deshell them. Cut each egg into three pieces carefully securing their yolks. 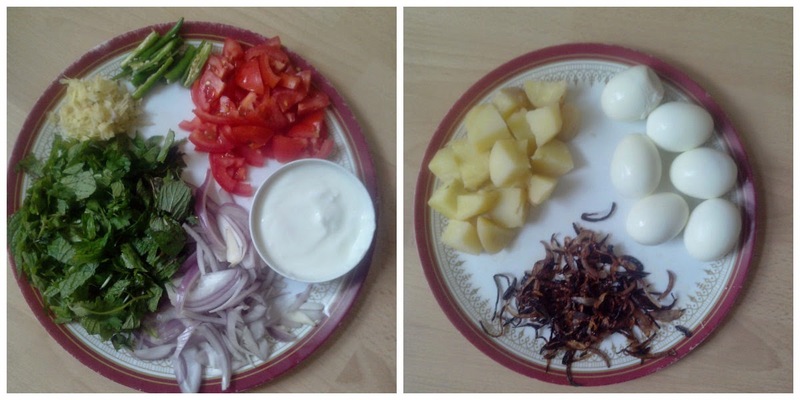 Cut the boiled potatoes into big pieces. 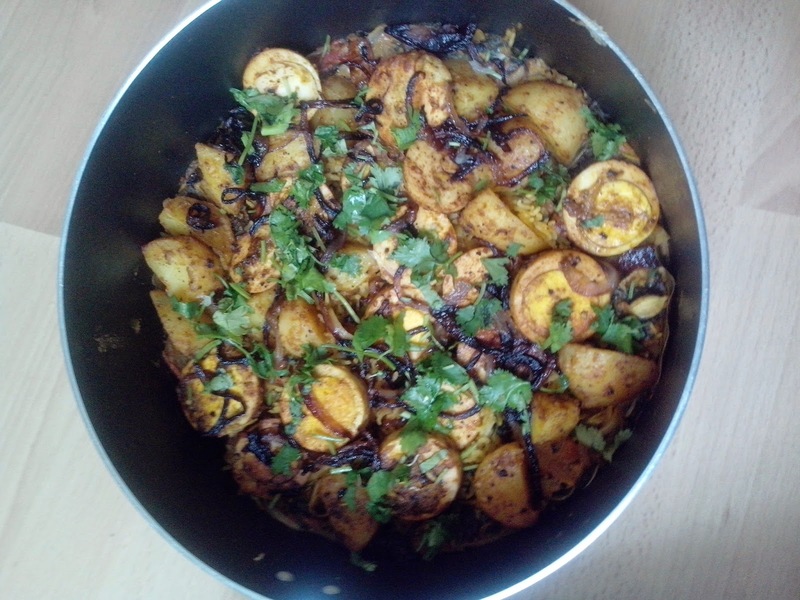 In a big pan, add oil and in very low flame, add 1/2 tsp chilli powder, pinch of turmeric, pinch of salt, 1/2 tsp pepper powder, a little GG paste and 1/2 tsp coriander powder and mix it well. Now add the eggs carefuuly and also the potatoes. Spread them and do not overlap them. If you do not have a big pan to fry them without overlapping , then fry eggs and potatoes separately. Fry them in low flame for 5 - 7 minutes until all the masala is coated on eggs and potatoes. Turn off stove and keep them aside. In a big heavy bottomed vessel, add oil and ghee and add all the whole spices. Then add the sliced onions and fry until transparent. Add the ginger garlic paste and saute it. Once onion and GG paste are sauted well, add tomatoes. Once tomatoes turn mushy, add green chillis, mint and coriander leaves and saute them for few seconds. Then add chilli powder, turmeric, coriander powder, cumin powder, garam masala powder and salt. If you have readymade biriyani masala , then just add it instead of all the above said spice powders. Add yogurt/curd and mix well. Add the soaked basmati rice (minimum 30 mins soaked) and stir well. Add required water and mix well. Close the vessel and let it cook for 5 minutes approx in med - high flame. After 5 minutes the water would be absorbed by the rice almost and rice would be half cooked. Now quickly add all the eggs and potatoes and spread them. Sprinkle the brown onions on them. After 15 minutes, turn off stove and rest it for 5 minutes., Now open the lid and add coriander leaves and squeeze lemon juice. Do give a try.. reach me at pavithiravijay@gmail.com for any queries.